So we have a few Jeeps. And there’s a guy known as the Beer Can Professor. Here’s a tale of collaboration. My husband loves vintage vehicles and the constant tinkering they require to keep running. Modern vehicles have quirky computers that spit out mysterious codes and tell drivers the air pressure in each tire. Older Jeeps hail from a simpler era, where tires were assessed by a swift kick and possibly a pressure gauge wielded by a curious human. The mechanics of older vehicles appeal to Mr. Fix-Its like the one I married. He’d tell you anyone with some common sense, a hefty paper manual, a set of air tools and some time to kill can tweak mechanical innards and save these classics from the junkyard. As it happens, Pearsall was perusing the web and learned about Jeep’s Movember contest. Entrants needed only to share a photo on Instagram of a Jeep and a beard and tag it with the contest hashtag, #JeepStacheContest. 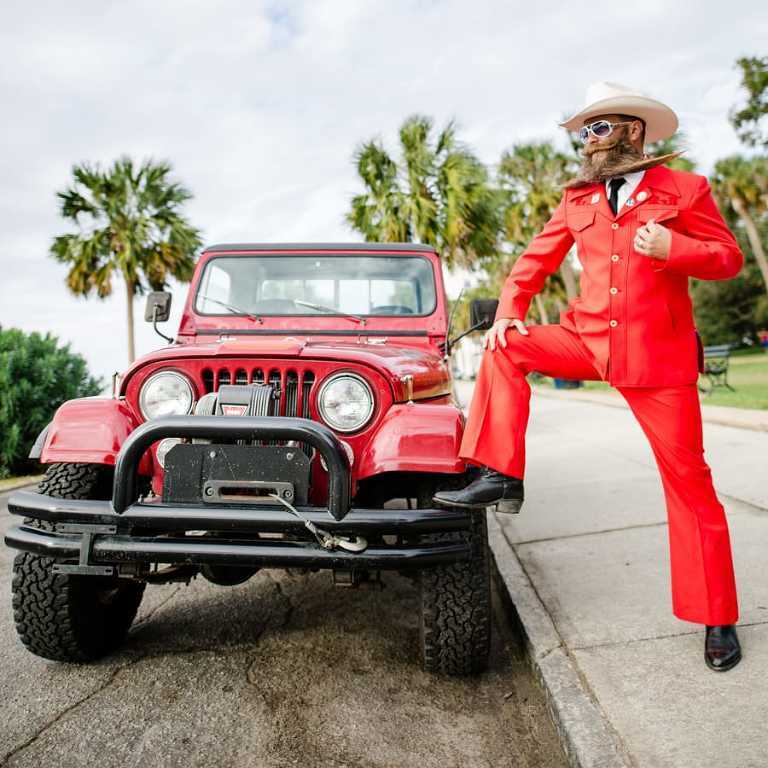 Knowing we had some good vintage Jeeps in the stable, and a girl with a camera at the ready, the hubby reached out online to a local Charleston celebrity with notably impressive facial hair. Paul Roof, aka the Beer Can Professor, agreed to meet me two days later to snap some shots so we could enter the contest on the last day for entries. We had big plans to split the winnings with Paul. Also, after skimming 28 days worth of less-than-stellar entries, we thought we had a good shot at winning the contest, a new Jeep and a pile of cash! Paul showed up in his signature flame-red polyester suit (as seen on the beer can that made him famous, Chucktown Follicle Brown by Holy City Brewing). He was gracious and easygoing, and we made some fun photos with our 1982 Jeep Scrambler and a few in the ’82 Jeep Wagoneer. It seemed like our collaboration yielded winning results, right? You think we should have won the contest? Not this time. But we had some fun. Thanks to Paul Roof, the Beer Can Professor, fellow Presbyterian College alum, insurance provider and purveyor of pomade. If you like this post, vintage wheels, beards or beer, I hope you’ll recommend it. And if you need a photographer for portraits, good times, weddings or beard-centric festivities, reach out to Carolina Photosmith. Cheers!